Sorry to have kept you waiting! Amidst all the Yuri!!! madness, I’ve finally made it back to my project on Anime ‘Writing’, with the bonus entry I promised over a month ago. 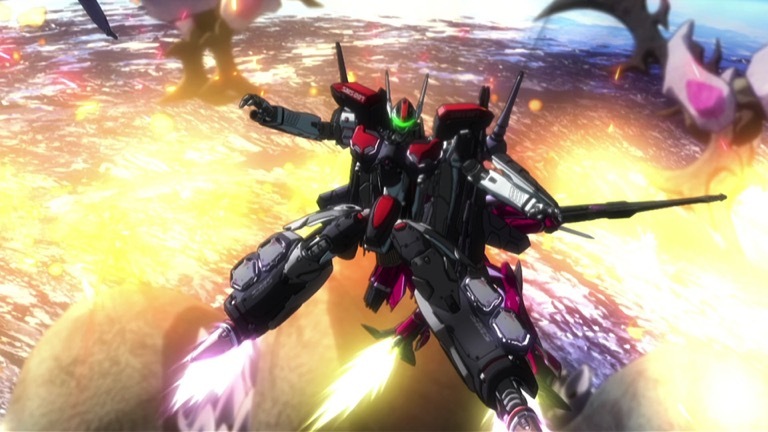 This time, let’s take a look at Kawamori Shōji’s comments on each and every Macross Frontier episode, from the TV series guidebook 2059: Memories. The first five entries are revised versions of what Gubaba posted years ago on a discussion forum…and I must say, I think I understand why he didn’t continue. The text is smaller than that of the main interview, so these were a lot longer than I thought they were at first glance. So please pardon any strange sounding expressions…by the time I finished it, I really didn’t want to give it another run through! This may be a TV series, but we’re aiming for it to be the culmination of everything from the Macross series up to this point. So Director Kikuchi and I split the storyboards for this episode between ourselves, and we were able to put in all the little details that we wanted to see. With the two of us doing it, 20 minutes just wasn’t long enough! (chuckles) We tried many experiments in the first episode. The parts that worked out well we brushed up and developed further in the following story. We tried Ranka singing, and Sheryl stepping in to add her her own voice, and I thought “That’s it!” Apparently Kanno (Yoko) had the same response during the recording. I did have a feeling it would go all right, but I actually shiver when I hear them sing together. That was when Kanno-san began rapidly sending me duet songs. (laughs). Well, someone always gets locked in at some point in Macross (chuckles). While we’d had people be trapped before, we’d never done it with three people. The “Tuna Bun” design was a labor of love for our scriptwriter Yoshino and the animator (laughs). 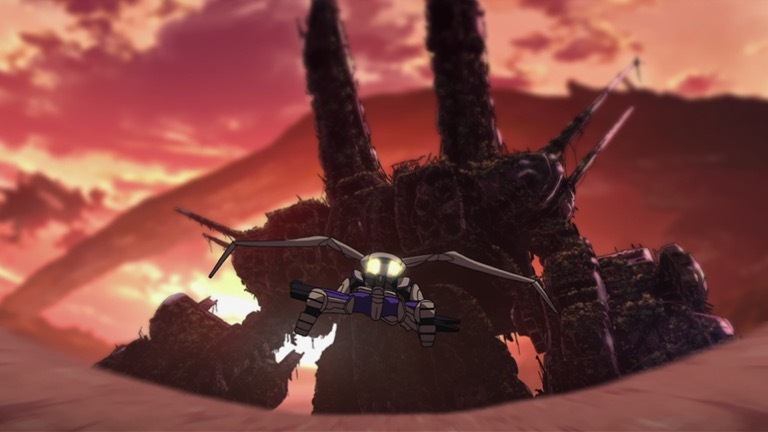 The “chest portion” of the episode was described by Yoshino, and the animator decided to imagine what it would look like. Griffith Park is a based on the landscape of the real Griffith Park Observatory in L.A. The main points here are Ranka singing “My Boyfriend is a Pilot” and Klan Klang. Because we’d anticipated Klan’s destructive power from the beginning, we decided not to include her in the first three episodes. Several young animators were in charge of the “My Boyfriend is~” section. Thanks to their work, over, the characters gradually began to more more and more, even in something like a singing scene, which is usually rather restrained (chuckles). This is an episode featuring Sheryl’s earring, a piece of foreshadowing that stretches all the way through to the end. At the same time, it also depicts the first time Alto becomes aware of “the person going off to battle.” We wanted to depict more of them at school, whilst also showing that war is something that directly touches their lives. Perhaps we were able to pull that off? As for mecha highlights, this was the episode featuring the Macross Quarter setting sail. Since we hadn’t had any battles for two whole episodes, that’s what we wanted to show off this time around. I believe that (König) Monster fans came away happy. And until now, we also hadn’t dedicated an entire episode to a concert and battle juxtaposed against each other, so it was a worthwhile challenge for us to tackle. It’s also the episode where Sheryl and Ranka’s emotions start resonating at a deeper level, so we quite naturally threw ourselves into it. For new idols, it’s pretty standard to go out onto the streets to hand out packets of tissue (chuckles). Right from the start, we’d decided to insert character-focused episodes in particular places. And since we’d actually planned to have Michel die during the first cour, this is where we decided to place his episode. But because he turned out to be a better character than we’d expected, we ended up letting him live a while longer. And for the scene where Zentra-Klan slaps his valkyrie: that’s something we really, really wanted to do. 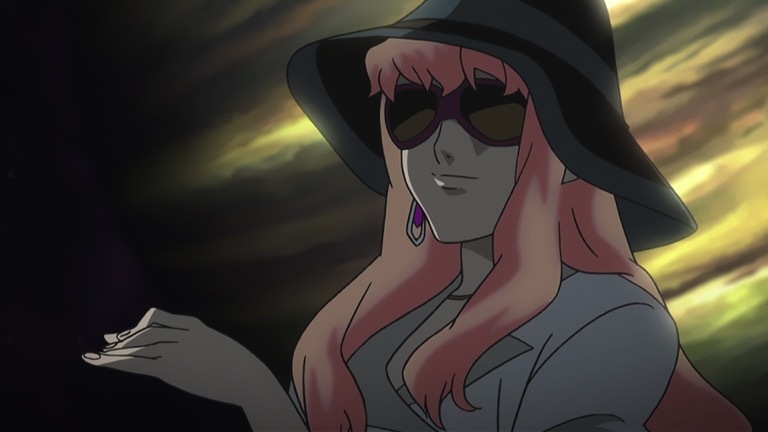 We’ve done “a film within a film” episodes in many of the series before, but having Ranka play Dr. Mao not only helped her get over an emotional hurdle, it also feels like we crossed time and space to connect this story to Macross Zero and the Protoculture. As such, it was rather thrilling making it. On a completely separate note, no matter how you think about it, Miranda was completely miscast as Sara (chuckles). To Alto, this was the decision of his life (chuckles). 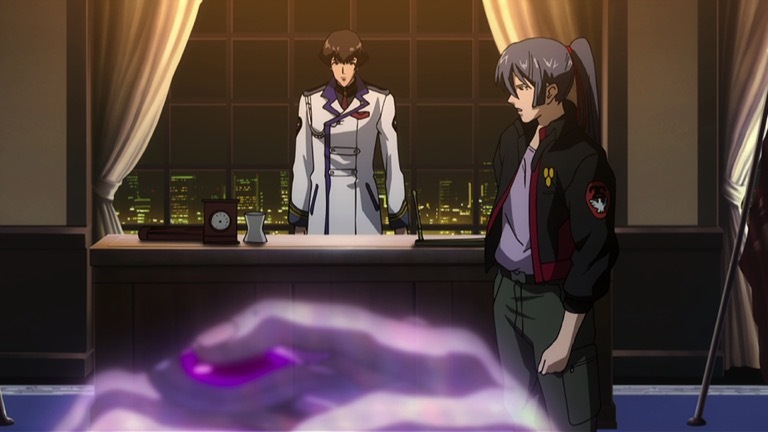 With her formal debut looming, Ranka begins finding it difficult to meet up with Alto. Nakajima (Megumi)-san often receives fan letters commenting that: surely it’s impossible for someone to become so popular so quickly after their debut. But in her case, that’s really what happened. After her debut, Nakajima-san’s life really did change pretty much overnight. 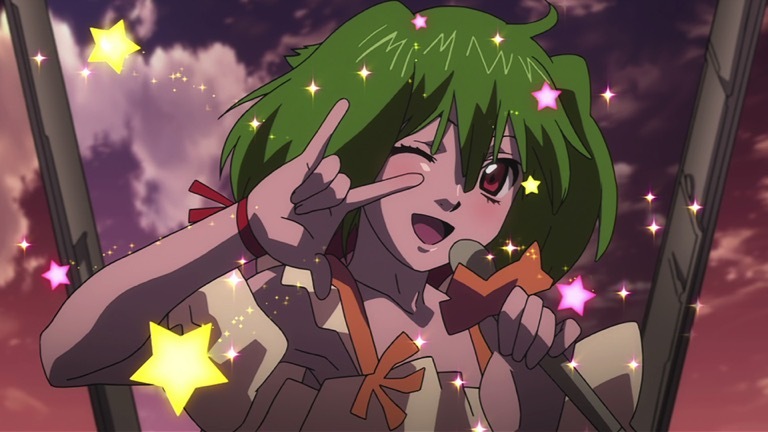 This is the episode where we poured all our energy into showcasing the song Ranka sings, “Interstellar Flight.” In the end, the most important thing was how we could bring out the charm in her “Kira! ☆” Having seen the choreography video, the Chief animation supervisor, Takahashi (Yūichi)-san drew us some great animation; and that’s what made this episode stand out. 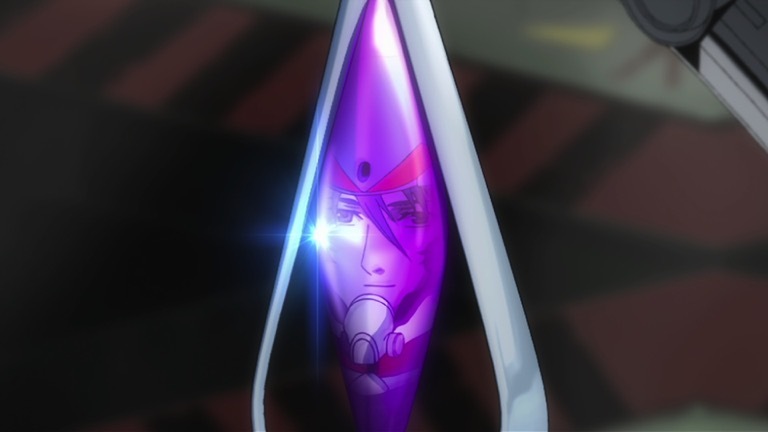 And of course, Ranka’s first audience had to be the Zentradi. 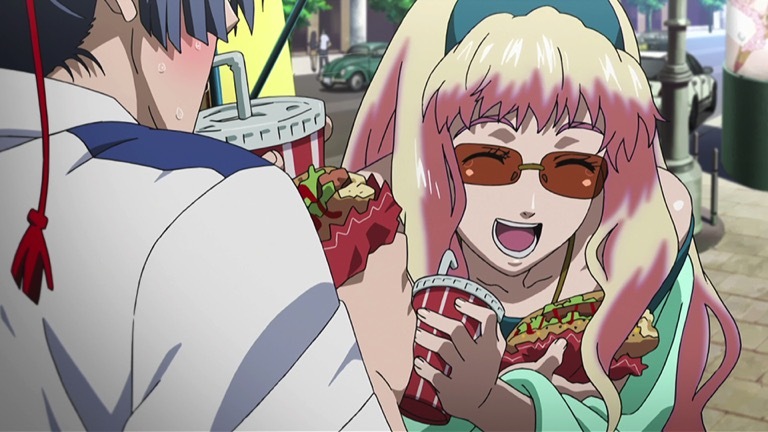 In this episode, the first half is quite heartwarming, but once Alto goes inside the Macross-class ship, the Global, that second half took quite an unforgiving turn. Alto was finally able to fly within a planet’s atmosphere, like he had so long desired, and it really is fun to have a valkyrie fly there. This episode is the turning point, so we had Sheryl’s illness and Grace’s scheming come to light. With an all-out attack from the Vajra, the war becomes even more serious. Because it’s the episode that marks this turning point of the expansion of the war, we’re also showing Grace going about in the shadows. 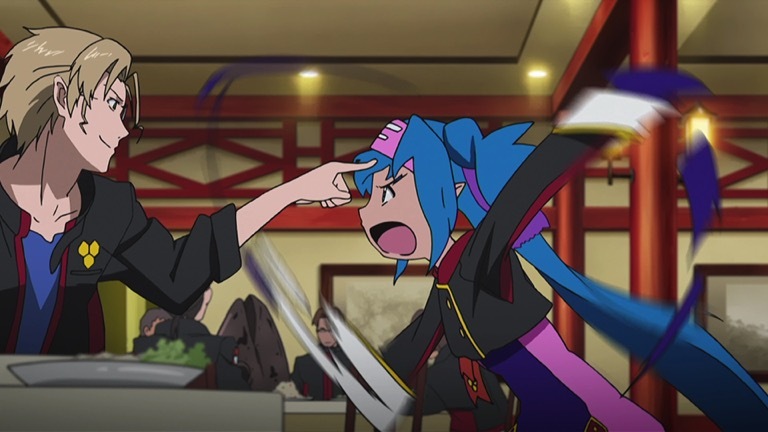 Ranka’s power manifests itself, and she begins to take Sheryl’s place. 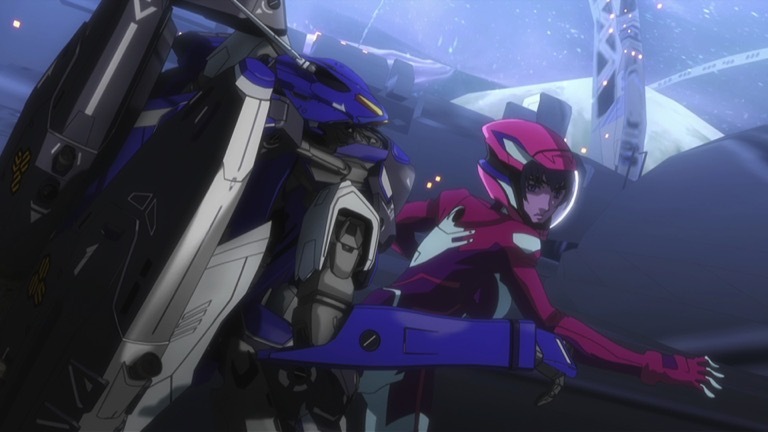 (If we consider Mylene a special case), Sheryl is the first songstress in Macross to fly a valkyrie. Though she was shot down pretty quickly (chuckles). At first, we’d planned to have Grace narrating an overview of events, finishing the first half of the episode with a reveal of Galaxy’s plot. The second half would be based around Leon Mishima’s long speech. We hadn’t intended to spend so much time on it. But there was something that we’d regretted not using in episode 5: the second half of “What ‘bout my star? @Formo,” which Kanno (Yōko)-san had delivered to us with Sheryl joining in in the second half. At the last possible moment, we came up with the idea of having a ‘love song battle’ between Ranka and Sheryl. Because Bilrer is a Zentradi, he has a warped, idealistic take on the Earthling’s Age of Exploration and the stories of the Western Frontier. The first half of this episode was designed to be fun, before the second half would plunge the audience into an escalating war and a strengthening militaristic feel, showing them what people do at such times. The core that this second half was built around was how Ranka’s song was usurped for military use. Because it’s a story about war, we wanted to show perspectives beyond the exhilaration of battle. We probably went a bit overboard with the pineapple cake here, so I’m sorry about that (chuckles). If you consider where Alto stands at this point, it would have been impossible for Ozma to die here. Compared to him, Alto and his peers at this point are still far too big-headed. Ozma is someone who knows the battlefield thoroughly, though every fibre in his body. You could say he’s like a “male animal.” But at the same time, he’s got a sister complex—that gap is probably one of his charms (chuckles). This was where Sheryl’s life hit rock-bottom, huh? (Chuckles) We weren’t bullying her because we wanted to, but I think Yoshino-san really had a heap of fun bullying her (chuckles). 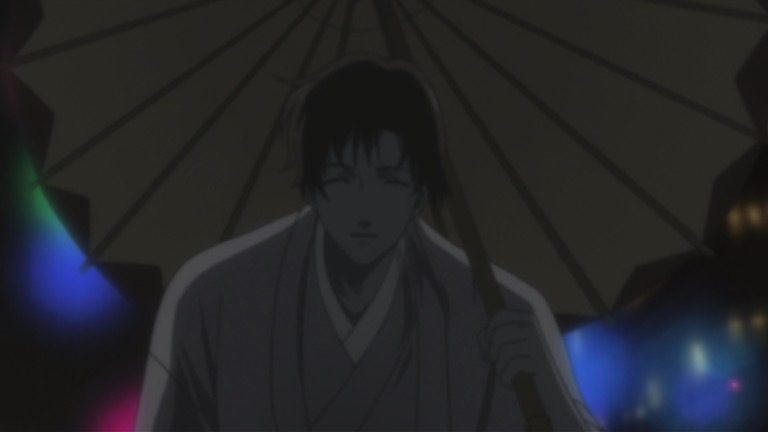 The appearance of Yasaburo, Alto’s older disciple at Kabuki, was also a clean hit from him. When Yasaburo appeared, I really went “He got us!” I really like how there’s a sense of “going mad with his art” within him. At long last, the triangle between Alto, Ranka and Sheryl comes to a head. Truth be told, we wanted to have a performance at the school festival much earlier, but we had no leeway in the number of episodes we had to work with, so we put it together with the fold festival. It’s the last time for merrymaking. From here on out, the plot develops really quickly, so we wanted to create a fun atmosphere, and also show Ranka as the sweet girl she is before we headed to the climax. The meaning of the lyrics of “Diamond Crevasse” were really effective in this episode, which covered Michel’s death. 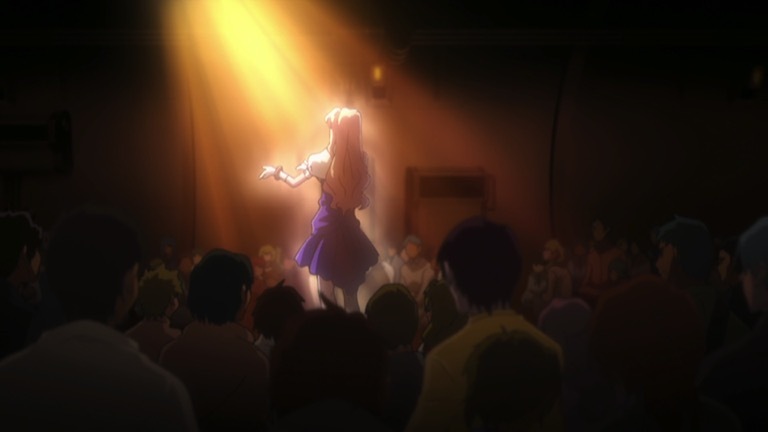 Furthermore, other than the duet in episode 15, it’s been a while since we’ve heard Sheryl sing. Since this was the episode where Sheryl stands up again, Kanno-san said that she would rerecord the song, so what we used here was a completely new recording. It’s pretty standard for episodes where characters die to be rather exhilarating, but we wanted to see if we could give it more depth and breadth than that. We worked very conscientiously towards achieving that goal with this episode. Having Klan transform into a ‘Valkyrie Maiden’ was something that we decided pretty early on. As for the Alto and Ranka’s parting—that was pretty cruel for her. 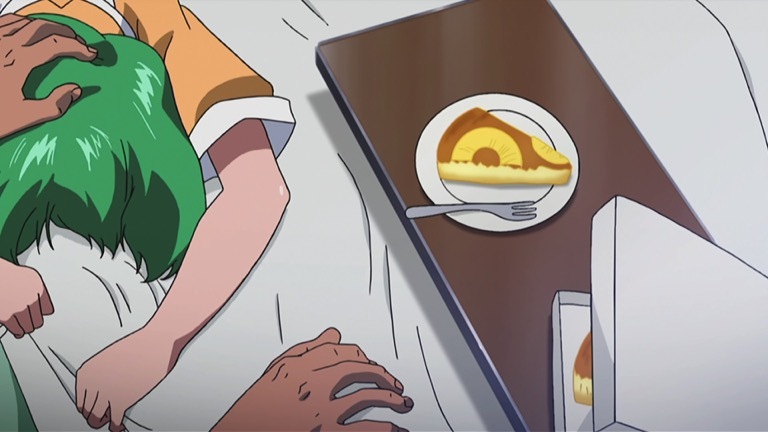 If Ranka had consulted Alto about Ai-kun before Michel had been killed, then Alto probably wouldn’t have reacted so badly. And she herself hadn’t known that Ai-kun was a Vajra. 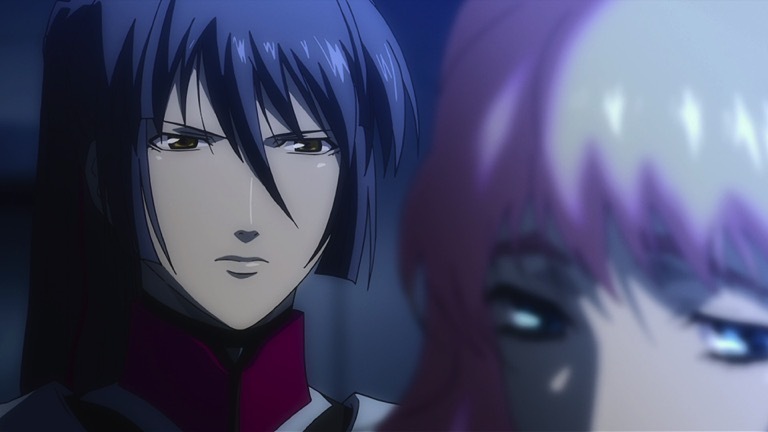 The expression of heartbreak on Ranka’s face in this scene is a point of note. No matter how you look at it, Macross Quarter basically defected here. At the time, we were saying that the staff and SMS were originally something akin to pirates. I thought that, for the notion of ‘a man’s romance’, we had to depict some dashing older men. Of course, Alto is still the protagonist. However, to break out of this severe state of affairs, I figured that you’d need guys like Ozma and Jeffrey, who are tough and who have the dynamism to move according to instinct and intuition. When normal people become wrapped up in a war, they tend to take actions that would usually be seen as strange. Paying heed to how frightening such hard truths are, we wondered if we could somehow present on the screen the rarified mood of being at war. 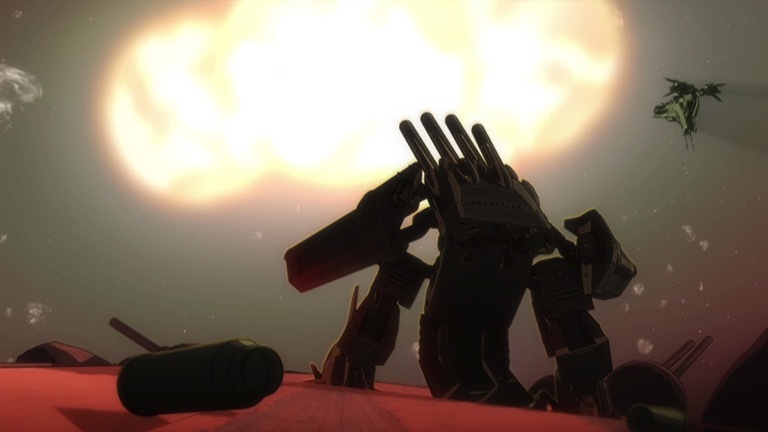 Here, Alto learns from Mishima and Bilrer the truth about this war—from one perspective—and about Ranka’s secret. And Ranka is captured, which sets the stage for the climax of the story. In any case, there is a lot of singing in this episode. 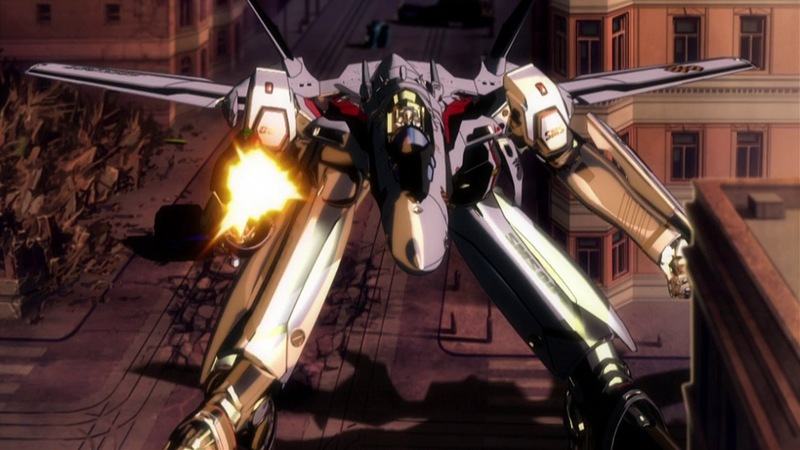 Over half of the episode required storyboards that were drawn in sync with the music—this is the densest episode in the entire Macross series, in terms of singing. Singing, movement, dialogue, sound effects—putting all of those together was like assembling a 3-D puzzle. It was really difficult trying to make it balanced (chuckles). Instead of watching an anime, I think it’s like you’re hurtling along through space itself.